Winter is in full swing it would seem. It is currently snowing like crazy as I type up this post. Is it spring yet? LOL! 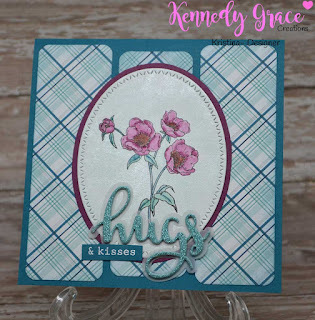 We've got a new inspiration board for Kennedy Grace Creations this month. Take a peek. 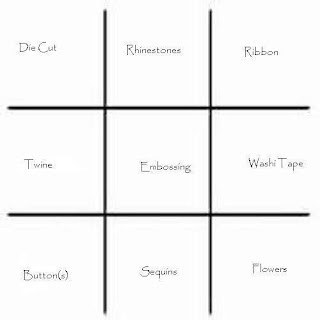 You are supposed to pick three elements, making a winning row of Tic-Tac-Toe. 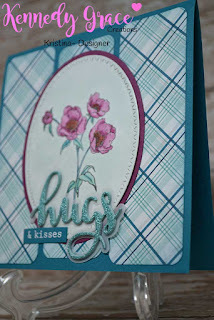 I chose to use the diagonal Die Cut, Embossing and Flowers row. 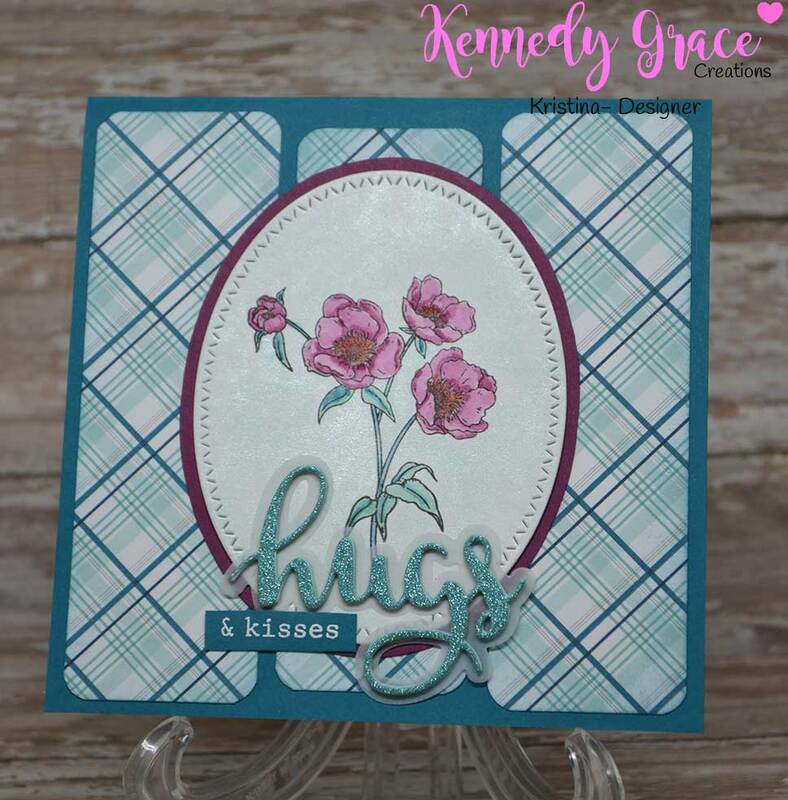 Kennedy Grace Creations has many different floral sets to pick from so it was hard to narrow it down. I picked Grace's Happy Heart. I stamped the floral image on a piece of Bristol smooth cardstock with a waterproof black ink. I picked out three different Stampin Up colors to work with--Island Indigo, Rich Razzleberry and Pool party. I squeezed the ink pad lids to get a pool of ink. I then used a water brush to pick up the colors. I painted the flowers with the Rich Razzleberry and used the indigo and pool colors for the leaves and stems. I waited for a bit to let the flowers dry. I mixed some of the Pool Party ink with water and Pearl Ex. It made such a lovely, shimmery color which I painted all around the flowers. I cut the white piece using an oval die from MFT Stamps. I freehand cut the Rich Razzleberry oval as I didn't have another die in the right size. I set the oval aside so I could work on the card base. The card base was cut to a 5 inch square from Island Indigo cardstock. The plaid paper from Echo Park was cut into 1 1/2" wide strips and I rounded all the edges with a corner rounder punch. I lightly sponged around all the edges of the plaid paper with Island Indigo ink before adhering them evenly to the card base. I glued the ovals on top of the plaid pieces and got to work on the sentiment. I cut the hugs die out of glitter cardstock and also cut several layers in Pool Party cardstock. I glued all of the layers together. I didn't think it stood out quite enough so I used vellum to cut out the outline version of the die. I glued it into place. The remainder of the sentiment I stamped onto Island Indigo cardstock and embossed with white embossing powder. I carefully glued it into place and it was all done! 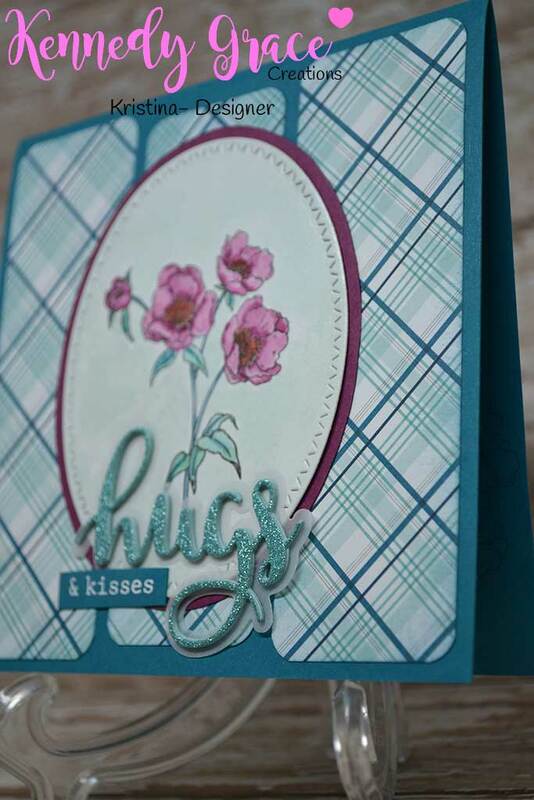 Here is a side view of the card so you can see the vellum and layers under the hugs die. 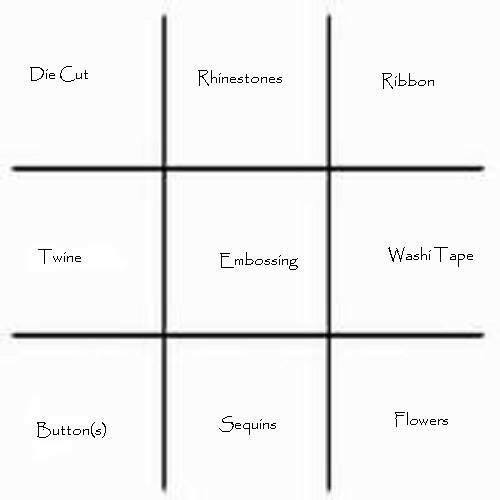 We would love to see you play along! Check out all of our links below.